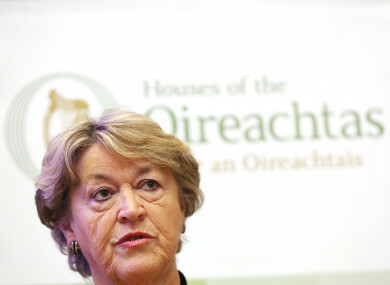 Owen spoke to Marian Finucane this morning about the progression of her husband’s condition. FORMER JUSTICE MINISTER Nora Owen has opened up in a personal capacity to discuss her husband’s journey of living with dementia. Owen, who was Minister for Justice under the Fine Gael government between December 1994 and June 1997, told RTÉ Radio One’s Marian Finucane that her marriage to her husband Brian has entered a new chapter in recent years because of the development of his condition. It was back in 2007 that the initial signs of Brian’s dementia began to rise to the surface. He had undergone an MRI scan of his brain which showed that he had suffered a number of mini-strokes, which the doctors warned would take their toll on his comprehension and speech in the long term. “I ignored it really, you fight against thinking it might lead to what it leads to. I never used the word dementia. If I thought he was saying something strange to somebody I’d say his hearing wasn’t great,” Owen said. By 2010, Owen said that it was clear that her husband’s condition was deteriorating. The couple returned to the doctor, ran tests and discovered that Brian did, in fact, have dementia. Detailing how her husband’s condition has progressed through the years, Owen took a positive approach, saying that she just “gets on with it”. “You know when parents are very proud when their two-year-old comes down and they’ve managed to put their socks on for the first time? With the onset of dementia you’re unlearning step-by-step the things that you knew,” Owen said. “I remember looking for the egg slicer one day and found it in the biscuit tin. There was no reason why it was there, but there it was,” she said. She explained that has his condition has worsened, many routine aspects of his life have become a struggle. “I noticed that if Brian was reading, the bookmark would stay in the same place all the time. The concentration was going,” Owen said. It’s a difficult, difficult condition to handle and the more personal things… people don’t talk about, the bathroom, the shower. I have to shower him and watch that he goes to the toilet. The more personal part of it can be difficult. While Brian’s cognitive health has continued to deteriorate, Owen said that he is still in good physical health. The couple has joined the Forget-Me-Nots choir in Baldoyle – a community choir for those affected by dementia and memory loss. “It’s wonderful, I love it. We sing old songs so he doesn’t have to learn new ones. You realise when people say music is a very good way of keeping people in touch that it certainly is,” Owen said. Despite being able to bring Brian to groups such as the dementia-friendly choir, Owen did say that other events can be difficult. “He’ll sit at a family party and he won’t converse very much,” she said. Email “'It's absolutely like minding a child': Nora Owen on caring for her husband with dementia”. Feedback on “'It's absolutely like minding a child': Nora Owen on caring for her husband with dementia”.